1. Motel 6's are great. Not for staying in (though they're fine for that too) but for providing a price baseline. Very often it's hard to know what is or is not a good price. Prices vary dramatically based on area and time of year, and even the day of the week, and very few places post their prices. Motel 6 is the cheapest of the chains, they're ubiquitous, and they usually advertise their price on the sign outside. 2. But don't check in to a Motel 6 just yet. Independent places can almost always be had for less than the price of a room in a chain motel, plus they're more interesting. If there's a Motel 6 in the area, drive by and note the price. Now you know the maximum amount you should have to pay. 3. Look around for an independent place. One good way to do this is to drive off the main highway. Most small towns have a main highway full of fast food chains and gas stations, and a "historic downtown" area that will be much nicer, and may have what you're looking for. If it has "bed and breakfast" in the name, chances are it costs more than you want to spend. What you're going for here is a place that looks scruffy but not scary. This is a subtle spectrum. To be honest, in rural and small town areas, I have never encountered a place that was unacceptable. Things can get dicier in large metro areas. 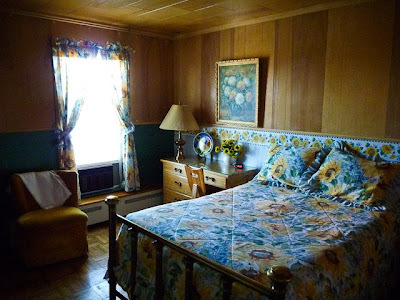 Little known fact one: from the seediest flophouse to the fanciest hotel, no one will be offended or surprised if you ask to look at the room before deciding whether or not to take it. 4. Inquire as to the price of a room. If it's more than the Motel 6, move on. Is it less than the Motel 6, but still more than you'd like to pay? You may be interested in little known fact two: hotel/motel prices are usually negotiable. I myself am a terrible negotiator, but there are things you can do short of saying, "I'll give you $29.95 and not a penny more!" For example, if you simply thank them and start walking towards the door, they may offer a discount. Anecdotally I'd say this works about 25% of the time in independent places. Even chains will sometimes offer unsolicited discounts. Not long ago I got almost 25% knocked off the price of a room in a Comfort Inn simply by asking if the first price she'd quoted me was more or less than the cost of the motel next door. "Hi, I'm wondering, how much is a room for one night?" "Are you a triple-A member?" "Are you absolutely sure you're not a triple-A member? I don't need to see your card." "Um... yeeeeah, I'm a triple-A member." As I said at the outset, I'm not really a budget traveler. It just happens that many of the ways in which I prefer to travel happen to be cheap. When you stay in some no-name ma and pa place you'll not only save money and support small business, you'll also end up in a more interesting room, I guarantee it. The sole advantage of the chains is predictability, and it is also their greatest drawback. 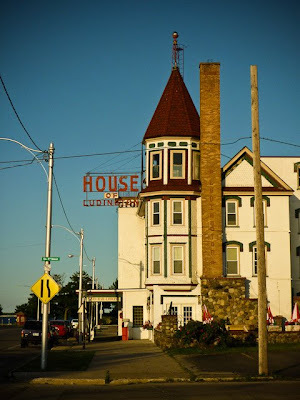 As proof, I offer the House of Ludington, in Escanaba, Michigan, where I stayed the night before last. 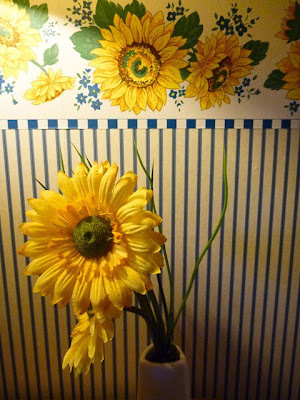 My room had a lovely sunflower theme, and a view of Lake Michigan. Great post! Too bad it wasn't up one day earlier, so I could have benefitted from your wisdom. After driving 10 hours from Iowa City, Iowa, to Youngstown, Ohio, last Thursday, I was too exhausted to look around for bargains. I stopped in at one place that had no room, then subsequently paid a ridiculous price for a room at Sleep Inn. Oh well.